I am an unabashed JOHN POWELL enthusiast. He is, in this reviewer’s opinion, one of the top composers of today. Powell brings a seemingly inexhaustible fresh approach to the films that have the pleasure of being scored by him. 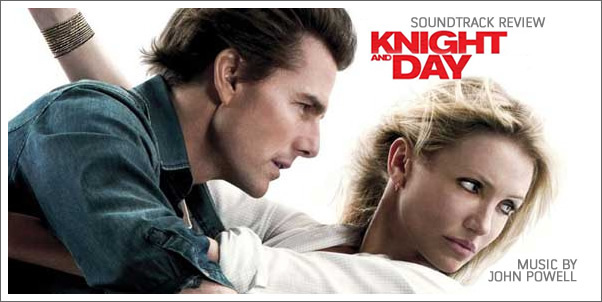 I was incredibly pleased to visit his newest score to the Tom Cruise/Cameron Diaz action flick, KNIGHT AND DAY. (I’m going to check it out, the previews look decent.) But, as I haven’t seen the movie yet, my take on the score is going to rely solely upon the merits of the music itself. 1) What it makes you think. 2) What it makes you do. In this instance, the answers are 1) fun action, and 2) tap my fingers and feet a lot. I think Powell has really captured the heart of the action-rom-com, and the formula is simple: Treat it like a dance. Really. Many of the cues here feel like rapid ballroom dance numbers, with extra zest. Some of them might be a little too rapid, a little too zesty, but overall, his approach works. A lot. The crazy Latin strings and beat in “Hostage” (Track 5) are so much fun to soak in. Even his Parisian accordion lilts keep the listener more at ease, than tense. Strangely enough, Track 7, entitled “To the Island of Love” is among the score’s most tense action tracks. I think you can hear a bit of “Shrek” in Track 16 (“Bull Run”), but the flamenco guitar flavor is intense enough to keep your mind off of green ogres.